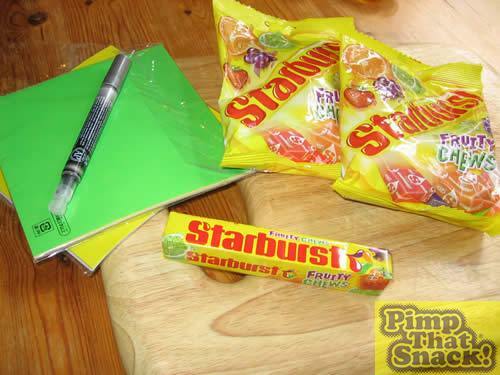 What better than to pimp the humble Starburst/Chewit/Fruitella?! Off to the shops I went, to search out these chewy nuggets of delight. 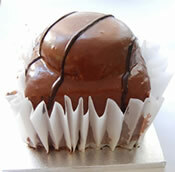 Now these kind of sweets seem to have fallen by the wayside somewhat in recent years. It is quite hard to get anything other than sacriliciously renamed ‘Starbursts’ in the chewy fruity sweets-in-a-packet variety these days, especially if you aren’t going to travel any further than Budgens. 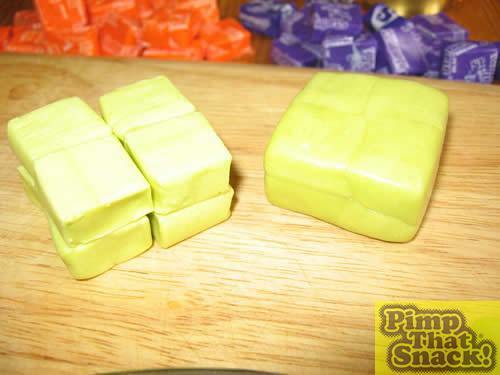 I bought one pifflingly small packet of Starburst, 45g, and 2 big bags, which weighed 200g each, totalling over eight times the weight of the original! 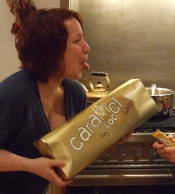 This was going to be a very large packet of sweets! I was also going to need some paper and pens to create some pimplicious shiny packaging. First, I opened both the packs, and sorted through them all, putting them in colour groups. What?! Only 17 purple ones?! And where are the yellow ones?! What was going on here?! 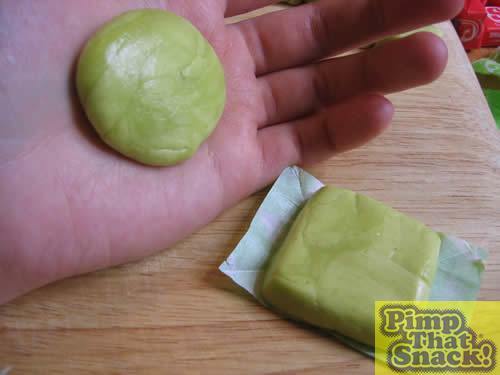 On closer inspection I discovered that the lemon flavoured ones have been incorporated into the lime ones, creating some new bogus flavour called ‘Lemon and Lime’. For shame, Masterfoods, for shame. 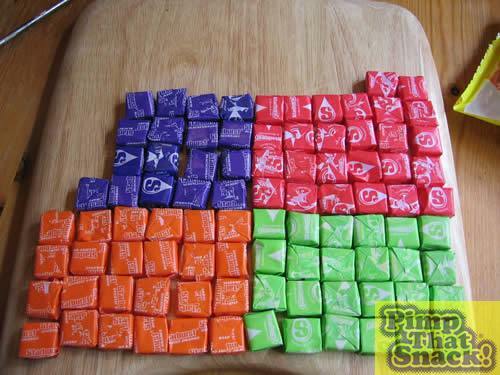 I figured it would be pretty easy to mould the individual Starbursts together, needing eight small ones to create one large one of the same dimensions. First I unwrapped all of the sweets, making sure I didn’t eat any and fighting off marauding sweet-pinchers. 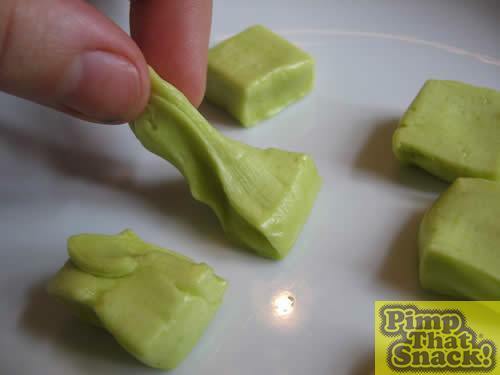 Then I moulded eight ‘lemon and lime’ together. 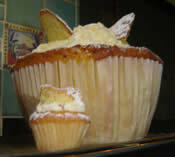 This looked great but took ages and it kept falling apart, which was a pain, so I busted out my gold plated microwave! Other pimps seemed to have had mishaps with their microwaves, so I tentatively put a few sweets in for 40 second blasts, which left the humble starbursts begging for mercy and flailing about like chewing gum. This was the perfect amount of time for the SB’s (Starbursts) to soften just enough to be pliable, but not so much that they burned a hole through my hand. Haha, suckers.